Until now, the history of the planet Mars has been divided into 3 broad eras—the Noachian, Hesperian and Amazonian—based on morphological considerations and numerous geological hypotheses. However, new analysis by the Mars Express mission have called these established epochs into question. 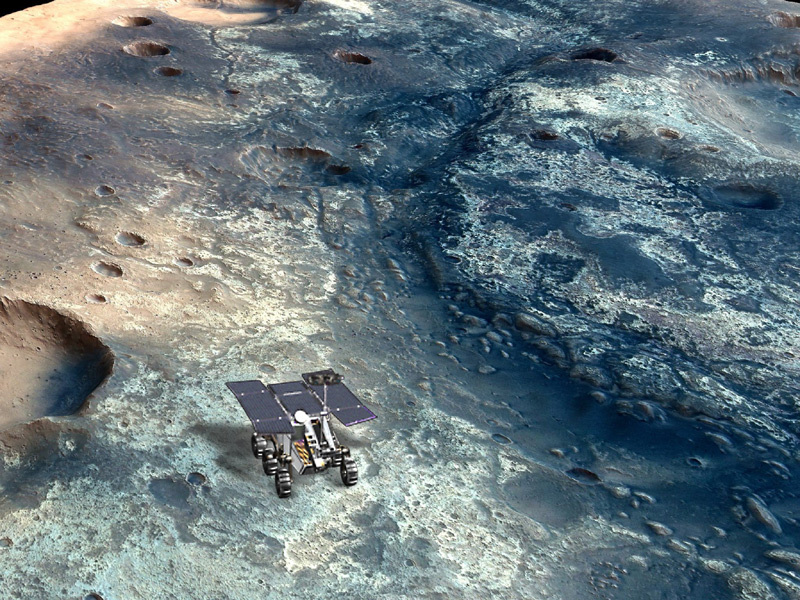 Precise mineral mapping using the OMEGA* instrument on Europe’s Mars Express spacecraft has led researchers to propose a new geological timescale for the planet. The re-drafted eras have been given new names, derived from the minerals formed within them. According to the new model, the 1st era is called the Phyllosian, when aqueous alteration of surface or subsurface rock formed clay minerals, called phyllosilicates. At the end of this era, intense volcanic activity coupled with the release of gases and sulphur into the atmosphere caused an acidic environment. Water is thought to have been present on the planet surface at this time. It is also thought that the atmosphere became thinner, due to radiation or violent impacts. As volcanic activity ceased, the water progressively disappeared, leaving behind sulphate deposits. This period, called the Theiikian, ended with the disappearance of liquid water and rarefaction of water vapour in the atmosphere. Finally, rocks exposed to the atmosphere were slowly but steadily oxidized. In the absence of water, iron turned into iron oxide. These molecules, in the form of hematite crystals, give the planet its characteristic red colour. The Siderikian period, which continues today, has produced relatively few geological events. In the light of these recent data, the Phyllosian era is the most likely to have supported life. Consequently, the clay beds formed during this period provide targets for future investigations to search for clues. * OMEGA: Observatoire pour la Minéralogie, l’Eau, les Glaces et l’Activité, developed by the IAS space astrophysics institute (France), LESIA space and astrophysics instrumentation research laboratory (France), IKI space research institute (Russia) and IFSI interplanetary space physics institute (Italy).